Marketing strategies have changed a lot in the last few years. Modern brands have become very aware of moment marketing by celebrating occasions like April Fools’ day that help them to connect with their audience more openly. Because 1st April is seen as the fun day and pranks are taken lightly by users, a good brand never fails to surprise with something creative yet funny. To make the most of this opportunity, Snapdeal came up with something that was not easy to guess as a prank. The e-commerce giant planned a prank about launching a shirt which changes colors with the help of smartphones. It looked so real that their teaser quickly went viral getting reach of over 10 Million in less than 48 hours. Snapdeal has now revealed that it was an April Fool’s Day prank. 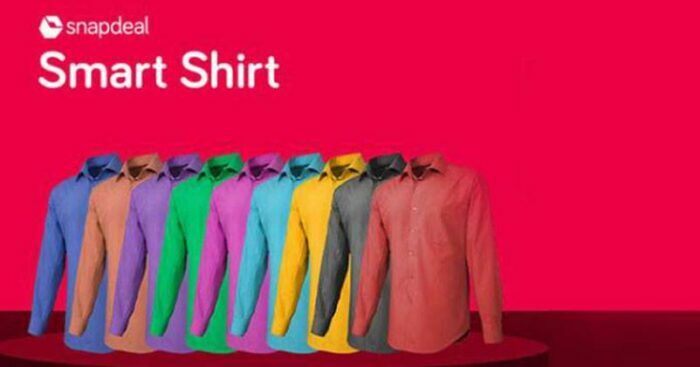 Snapdeal really got the better of online audience with this prank as its execution made a lot of users believe that the company is launching a color changing shirt. This belief became strong due to their regular posts on social media that created curiosity among online users. The best part about this activity was that it is not relevant only for April Fool’s Campaign. It effectively showcased an amazing collection of cool and interesting products available on Snapdeal at unbelievable prices. It was a great way to promote the collection of such products including automatic toothpaste dispensers, ninja tool kits, fruit cutters, travel tool kits, portable blenders, portable tyre pumps, USB water coolers, fans, magic balloons, mini fans and many more which are available under Rs 500 at Snapdeal. To make this shirt talk of the town, Snapdeal made sure that this prank reaches to its target audience. It became possible only because of partnering with India’s biggest meme factory- RVCJ media which delivers funny and relatable content on daily basis. RVCJ not only helped in increasing the reach of this prank but the regular memes made users believe that the idea of this shirt is real. We created this campaign with the intent of doing something different and engaging the audience. Shirt is something which everyone uses daily; we thought of adding a technological twist to make people believe. An April Fool’s Day prank is incomplete without the right strategy to reveal the prank. Snapdeal had given a link to register for this shirt. The features were shown in such a smart way that they made the reader greedy to buy the shirt. Users were quick to fill their details and grab the opportunity to prebook and whoever filled the details, is getting a message from Snapdeal wishing April Fool’s Day on the website and through Emails & SMSes. This campaign totally justified Snapdeal’s image as a cool brand, which over the years has resonated with its audience. Last year on April Fool’s day, Snapdeal announced that it was launching delivery through pigeons. All in all, full marks to Snapdeal and RVCJ for coming up with something fresh yet relatable to the brand and audience with their marketing skills.